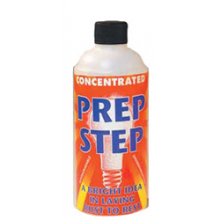 Prep Step is a biodegradable, surface cleaner/conditioner for rusty steel or freshly prepared steel that has been dipped, stripped or sand-blasted. It removes dirt, grime, greases, oils, and silicone from steel surfaces without harming sound painted surfaces. Prep Step will soften and help remove loose rust particles, while solidifying the tight rust left behind. It also phosphatizes the surface and adjusts the PH to 6.0, thus creating ideal conditions for paint adhesion. Prep Step is not an acid. For heavily rusted surfaces, this environmentally friendly product is solving many long-term protection problems. Convenient easy-to-mix powder formula (Mix with hot water and apply with a spray bottle or pump sprayer). Softens & cleans existing rust for removal with wire brush. Thoroughly Cleans and Conditions all surfaces of any dirt, oil, grease, silicon and other contaminants. Using prep step will increase the performance of any paint by up to 400%. Immediate painting of surface not required – prevents flash rust from occurring for up to 30 days. For heavily rusted surfaces, prior to wire brushing or scraping, dissolve Prep Step powder in hot water in these recommended amounts and spray with a spray bottle or garden-type pump sprayer. Wire brush or scrape surface to remove loose scale, then rinse thoroughly with plain water to remove the loosened rust and any other contaminants. Follow step #2 below before painting surface. For conditioning clean metal surfaces (prior to painting), dissolve 6 ounces of Prep Step in 3.5 gallons of preferably hot water and spray on clean surface with spray bottle or garden-type pump sprayer. Let Prep Step solution dry thoroughly on metal surface before painting – DO NOT rinse with plain water. (Note: this step will prevent flash rust from forming on metal surface for up to 30 days, depending on temperature and humidity conditions, so immediate painting is not necessary). For power washing, dissolve 24 ounces of Prep Step in 10 gallons of preferably hot water and spray at 3000 to 4000 psi. Click the button below to add the Prep-Step .75 pound to your wish list.